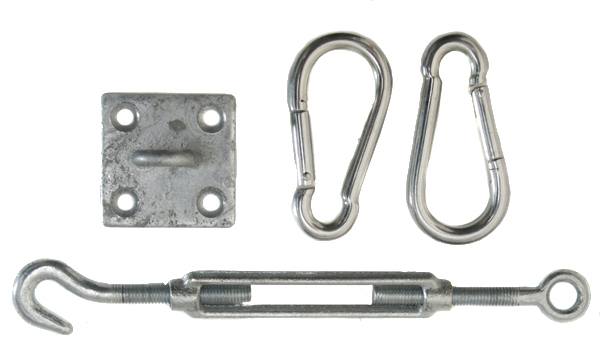 This galvanised steel fixing kit is ideal for installing triangular sail shades to all solid structures such as concrete, brickwork and wooden beams. The high quality, galvanised steel fixtures are extremely strong and rustproof. The kit includes everything you need for quick and easy installation. Installing a sail shade doesn't have to be complicated - please see our Installation Instructions for more information, tips and advice for installing your shade sail quickly and easily. "Love the size and colour, not put up yet." "All good quality and robust"
"well made and easy to fit"
"As expected, good quality components." "very good dispatch, product and customer service"
"Would have been good if instructions included for the wire cable and wall fittings ." "Very high quality for the money, strong but functional"
"EXCELLENT PRODUCT, HIGH QUALITY AND REASONABLE PRICE." "Hardwearing. All parts in one set"
"Good value. Robust and easy to erect"